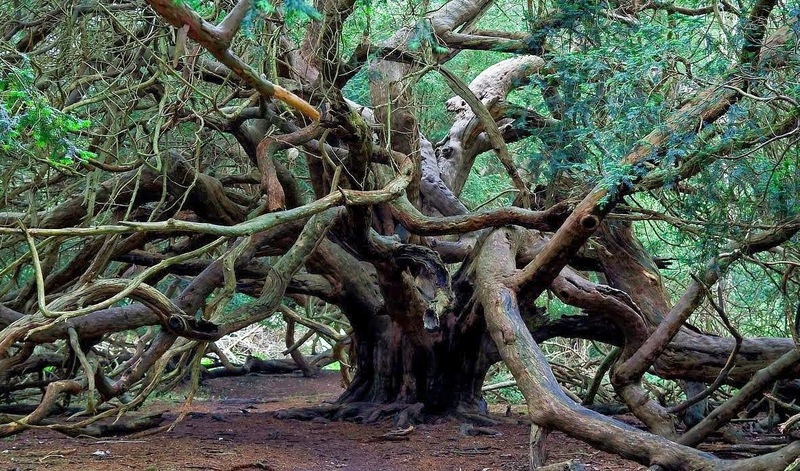 There are several venerable old yew trees in the British Isles. Each one of them has a great many tales to tell I'm sure. However, one old tree, the location of which I shall keep secret, has tales to tell from many hundreds of years ago. The recent stormy weather ripped limbs from many trees and completely downed many hundreds up and down the land. Our tree fell victim to these winds too and a huge section of its massive central trunk fell away; ripping a huge section off the tree's Eastern flank. On inspection of the damage a horde of silver and gold Roman coins has been discovered. They were in a lead box and it is thought this had been hidden in the trunk of the tree for many hundreds of years. It is of course not possible to know exactly when they were hidden. However the lead box is inscribed with Roman letters and although crushed over the ages it is possible to read the word 'arbor' - Latin for 'tree'. The local museum has provisionally valued them at "Not less than 4.5 million pounds." They would not be drawn on when the box had been hidden, but do not rule out the possibility that they were hidden there during the Roman occupation of Britain. They await the results of a dendrochronological survey of the tree being carried out by Durham University. The newest coin has been dated at 379 AD so obviously they are all at least 1635 years old and may very well have been in the boughs of the ancient tree since that date. If all this seems a little too incredible to believe look at the date of this post.